There is a paucity of resources on the methodology used by professionals involved in the authentication of artworks. A task primarily conducted by the art market, museum sector, academia and law enforcement, authentication involves the adoption of an array of technologies - coupled with traditional visual methods, known as connoisseurship. Of great concern to many is the mode of reporting of this information. There seems to be no consistent standard. Those trained in any form of scientific writing will at once be familiar with a standard report format - those more closely acquainted with statistical analysis will be able to understand universal language such as null hypothesis, p value and validity including a consideration of types of error and bias. Whilst the language of art authentication does have common terms, it is often based on outmoded concepts from the 19th and early 20th century. The very fact that these experts are still called connoisseurs, rather than analysts (or any similar term) is a clear reminder of the pretensions associated with the business of art acquisition and verification. The origin of modern connoisseurship is closely linked with the business of collecting - especially from the 17th century onwards. Much has been said at this site and elsewhere on the efforts of the late James Beck and Oxford University's Professor Martin Kemp - whose respective publications looking at the authenticity of works by Raphael and Leonardo were bold steps forward in the mode of reporting the art authentication process. That these two approaches were at times wildly disparate in methodology, language and format is greatly illustrative of the unordered chaos this branch of inquiry is in. Another valid contribution to this discussion comes from the art market sector. Dr. Bendor Grosvenor is an art historian by training, and an art dealer by trade. Working in conjunction with Philip Mould, has made a career of identifying lost works by old masters. Readers of this site will be familiar with Grosvenor as the researcher from BBC's Fake or Fortune, guiding the investigation into the alleged Monet owned by Mr. David Joel, and staunchly contested by the Wildenstein Institute. Grosvenor also has an increasing web presence now, with a greatly informative website and twitter feed. We should perhaps note here that the very concept of connoisseurship is a controversial one. It has been since its heyday in the early twentieth century, when many art historians relied too heavily on their 'instinct' to attribute paintings....Then there was the problematic question of a 'connoisseur's' connection to the art trade. After all, if a famous art historian such as Bernard Berenson had merely to look at a painting to declare it, without any corroborating evidence...then its value would soar (which of course pleased Berenson's employer, the famous art dealer Joseph Duveen). From about the 1970s onwards, art history as a discipline saw considerable reaction against connoisseurship, and by extension the whole question of making attributions based on visual evidence. In essence the study of the object, be it a painting or sculpture, became less important than the study of its context. Some art historians went as far as to declare the very notion of authorship irrelevant, their thesis chiming with with the growing trend amongst historians to turn away from the study of the individual (not to mention the rise of literary criticism). As a result, both art history and history as disciplines increasingly focused on identifying other elements...be they economic, social, or gender based in a headlong quest for generalisation. The result today of this shift away from what we might call the traditional history of art is that not enough art historians are, if we may say so, connoisseurs. Indeed, it is not unknown for those few art historians who study 'the object' empirically, or attempt to write a catalogue raisonné using connoisseurship (the 'C-word', as it is called), to be derided by their peers. There are signs, however, that the pendulum is swinging back. Modern connoisseurs are greatly aided by new technology...now high-resolution computer screens and digital photography permit the close scrutiny and instant comparison of paintings that are thousands of miles apart. For a growing number of art historians, therefore, connoisseurship is increasingly recognised as a skill in assessing paintings - even if it is no longer (rightly) considered the only skill. Until this is realised, I would like to present the following guide. It is aimed at anyone with an interest in the topic. Not being part of the art market, museum sector or academia, I can only stress that the below guidelines are for the benefit of consumers of information. Whether you are a member of the interested public, a student or an art historian who has not had a great deal of training in evaluating art in these terms. The following points can assist you in wading through the variable standard of reporting we are commonly presented with in mainstream media, and dare I say some art historical publications. These particular guidelines are of course framed with European painting in mind, though are easily malleable to fit any medium or location. *Is the subject of the piece, symbols used and style of depiction typical for the artist/patron era ? *How does the painting fit into the artist's known chronology from a stylistic viewpoint. eg. Raphael's innovations following his exposure to Florentine artists such as Leonardo and Michelangelo. *Is the composition, arrangement of figures and execution consistent with the artists known work? *What is the provenance, or ownership history of the piece? *Are there primary sources from the era the painting is believed to be from? eg. contract or payment documents, relevant correspondence from artist and patron mentioning a work. Are these corroborated in more than one source? *Are there secondary sources from/close to the era the painting is believed to be from? eg. a Venetian diarist observing Raphael's Portrait of Julius II in the Santa Maria del Popolo in Rome in 1513. *Is the condition of the piece described? Has the extent of restoration and/or cleaning been described - when was this done, what was done? *Is underdrawing or pentimenti evident from visual analysis? *Does more than one copy of this piece exist? If so, what is the corresponding level of detail reported for each version. eg. Raphael's Portrait of Julius II - National Gallery London, Uffizi and Pitti versions have each been touted as the original at some stage! *What is the surface and media eg. drying oils on poplar, canvas etc? How has this been confirmed? eg. visual determination of a panel being poplar is not as reliable as a confirmation made via microscopy. *Are the materials used, preparation of surface and execution of painting consistent with the artist and their era? nb. This includes consideration of preparatory cartoons, modes of transfers of this to final surface, and means of preparation of the surface and sequence of application of pigment layers, glazes etc. *Have the surface and media been tested for age and chemical composition? eg. Carbon dating the wood of a panel, analysis of the fibres of a canvas or detection of "lead tin yellow" - a pigment commonly used in 15-18th century European art? *Does scanning with modalities such as infrared, X-ray or multispectral technology reveal any further information about the surface, media, underdrawing or pentimenti? Worth expanding upon here is whether the efficacy and accuracy of the modality been described. You do not need to be trained the scientific method to note how reports present their data. For example, is it presented in data tables, graphed results, including measures of probabilities and degrees of accuracy, a plain language summary, or something in between which apes scientific language? To date the vellum, a tiny sample of the parchment was removed near the edge. 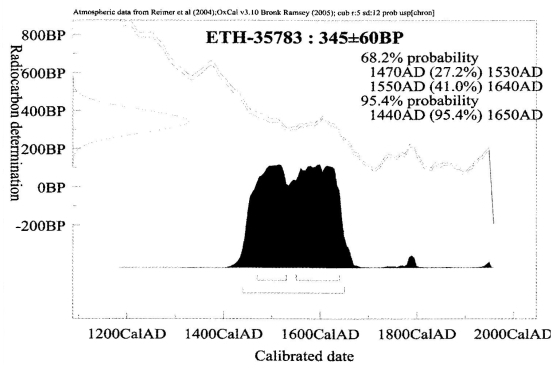 This was subjected to carbon-14 analysis, which provided a 95.4% probability of a bracketed date of AD 1440-1650. The use of the word "hypothesis" raised questions as to what the hypothesis originally was and how this was tested. There is an outline of the focus of the testing in the document, but it is not presented in a fashion that suggests an experimental design, including the statement of a null hypothesis or assignment of controls and exploration of possible confounding factors. The word "hypothesis" is hence being used in a general manner, which is inconsistent with other elements of the presentation that are quite technical in nature. The same query can also be made of the identity of the sitter being confirmed to a "high level of probability" - this degree of probability is perhaps beyond quantification - how it can be high or low, and in reference to what seems out of place. We can of course understand the unique and challenging situation Cotte and Kemp are in. Having chosen to present the scientific data as part of the main corpus of text - there is a constant trade-off required between the ability to deliver the details and presenting this information in a manner palatable to the target audience. We can only hope that as more reports of this nature are written, that the familiarity of readers with technical language will improve. *Who did the testing and reporting? Was it done by an independent body, a gallery, or group of scholars and/or technicians? *Who funded the testing and reporting? *Has anyone expressed any doubt with any of the findings? What evidence are these criticisms based on? It is important to re-iterate that the above is a guide to evaluating information. The task of evaluating (and pricing) artworks is best left to the individuals involved in those professions. It would of course be in the best interests of all to develop a more standardised means of testing and reporting - but this type of change must come from within the industries affected. Next time you wade through reports on attributions, or browse a catalogue - you will notice a great degree of variation in how each addresses the points covered under SDCC. Complicating issues further are when great discrepancies in opinion are found on the same piece in different volumes on the same artist - which is the bane of Raphael studies for example - but more on that later. 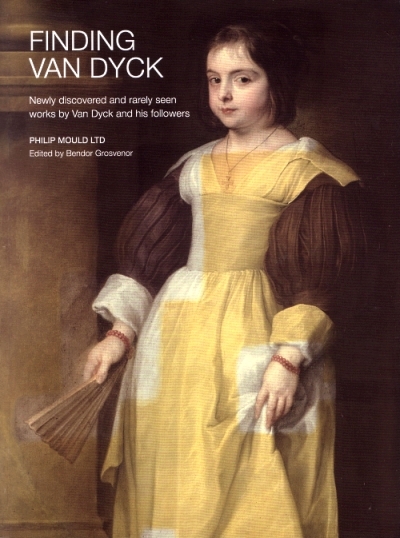 *If you are interested in purchasing a copy of Finding van Dyck please make your enquiries to the Philip Mould Gallery in London. It provides a fascinating series of case studies on the process of determining authorship using both modern tools and traditional visual methods. Great guide! I think you have presented a good, basic approach for those interested in the process of authentication. On a related note, have you ever seen any publications by auction houses on authentication? I would assume that they publish something to train employees and the like, right? Hi M! I was wondering the same thing - Dr. Grosvenor may know the answer. I definitely have not come across a publication that is held as a definitive text on the topic. Remembering what ensued in Mr. Joel's case in Fake or Fortune it seems the auction houses put much stock in established catalogue raisonne(s) on the artist. There are tech documents written with the conservation crowd in mind, and then there are the catalogues, but nothing bridging both outside of volumes dedicated to particularly well known artists - eg. more recent catalogues on Raphael and Rembrandt have elements of the conservation/restoration data included. As far as training goes - I don't think its wildly innacurate to say there are differing levels of expertise out there - compare the New York based scholars from Christie's whom happily accepted the 19th Century attribution for 'La Bella Principessa' to the findings of Prof Kemp and Mr Cotte, working in this instance independently of the auction houses. Great post, thank you. As an 'amateur art historian' with a background in the 'hard' sciences, I fully agree of course with your plea. In the list 'Documentary evidence' I would add: * Auction Catalogues, such as one can find in e.g. the Getty Provenance Index. A more important comment is the standard terminology of the autorship, which could be added to your fourth letter C 'Consensus?'. The statements in the list below are transcribed from an 1992 auction catalogue of Sotheby's. I wonder if indeed there is a standard terminology, approved internationally by an authority? a) Ascribed to the named artist (highest category of authenticity). b) Attributed to...(probably a work by the artist but with less certainty). c) Studio or Workshop of...(work may or may not have been executed under the artist's direction). d) Circle of...(work by an unidentified artist closely associated with the named artist, but not necessarily his/her pupil). e) Style of... Follower of...(work by an unidentified painter working in the artist's style, contemporary or nearly contemporary, but not necessarily his/her pupil). f) Manner of...(a work in the style of the artist and of a later date). g) After...(a copy of a known work of the artist). * the term 'bears' a signature/date/inscription means...added by another hand. Plenty of material for discussion and to agree upon. A standard terminology is an essential prerequisite for any scientific methodology. Cheers for the input K Bender. I definitely agree a standard terminology and report format is required. In my post on defining authorship, I explored Professor Beck's differentiation of the phases of work common to a Renaissance workshop - which he used to describe Raphael's possible input into a version of 'The Madonna of The Pinks' This falls in nicely to the "C" connoissuerhsip section as it looks at under-surface scans and compares them to any extant preparatory drawings. Thanks, Hasan! It is fascinating to see an objective observer with a background in clinical practice bringing methodological rigor to bear on this wriggling mass of issues. In some ways, the case of “authorship/attribution” brings to mind the predicament of the social sciences where practitioners are often required to force soft data into strict frameworks. At the outset, you threw the emphasis on the “players in the game” rather than the “rules of play”—and you were absolutely right to do so. You noted four teams on the field, as it were: (1) the art market, (2) the museum sector, (3) academia and (4) law enforcement. There is one apparent danger in the way that you set out the problem. You seem to imply that the artist made all of the essential decisions regarding the subject, content and style of a work of art. (There are of course many layers of “style”.) This is somewhat tendentious, since there was also the individual or organization who commissioned and/or paid for the work of art—which was often intended for a particular use or context. In many historical situations, it was the “patron” who was considered the “author”! And your criteria are most immediately applicable, I would think, to European (or at least Western) works of art, beginning in the late Middle Ages. In regard to “Connoisseurship—Visual and Technical Analysis”, I don’t see that you gain anything by invoking “the C word”. Doesn’t “Visual and Technical Analysis” do the job on its own. Under “Visual”, you conflate considerations regarding (1) the “creation” of the object—composition, execution, etc., and (2) later “post creational” factors, like “condition”—although the way a work was made certainly affects its present condition. Plus “copies”. The perceived relationship between originals and copies is one of the more tendentious judgement calls. In regard to “Consensus”, I couldn’t avoid cracking a smile! Considering the range of opinions from “art experts” over the years, the ultimate value of “consensus” is far from overwhelming. Matters are of course different in the hard sciences, where peer review has real value. I often hear friends on that side of the fence say, “This is good/bad science” or “I wonder about the science in that project”—and everyone knows more or less what they are talking about! Anyway, Hasan, I am sure that we will be discussing this more in the future. And thanks again! Many thanks for the amazingly detailed and thoughtful reponse Ed! I agree that patrons' wishes should have been specified under 'theme' so have edited to include it there. Of course, I did not exclude the patron from the outset, putting their involvement in under the 'documentary' heading. As for 'Connoisseurship' - I can assure you I am least fond of the term as anyone can be - but I am aware that I am treading in the realm of others, so place it there as a reference point - particularly as I was quoting Dr. Grosvenor so heavily, I needed to include this term to link it to "visual and technical analysis" - which is what this terms translates to in my summary. As for consensus - as explored in a previous post on the dangers of consensus - examples of group decisions gone wrong abound, but as always there are confounding elements : consideration of whom funded the investigation, and rounded up the consensus members is important. Hence I included it in that spot to encourage readers of such reports to remember to ask that question. eg. Who organised the consensus for 'The Madonna of the Pinks' is an uncomfortable question for the National Gallery of London! What will ensue in the fields affected is of course beyond my control - but with the above guide - I was at least hoping to provide some pointers to readers of these reports on how to pick through PR speak and connoisseur jargon.